Garavini began in Turin, Italy in 1908 through the work of Eusebius Garavini with the name "Body Piedmont." In the early years of operation exclusive chassis were produced by Diatta and soon the two companies merge into "Diatta and Garavini. In 1914, "Garavini SA" followed by "Stabilimenti Garavini Carrozzeria" in 1933. The company suffered substantial damage during the First World War, but managed to recover and set up and work with some luxury cars in Italy, Isotta Fraschini, Alfa Romeo, Fiat, OM, and Bugatti, as well as several ambulances and buses. In 1927 the Garavini patent systems "Pluemelastica and Plumacciaio", a valid alternative to the famous patent "Weyman elastic body" to solve the problem of rigidity of the frames that, because of roads, shook the body until point of failure. It was therefore necessary to anchor the body in an 'elastic' format, reducing the noise. During the crisis of 1929 the work of a heavy body undergoes arrest. At that time the Garavini has a staff of 30 employees and about 230 workers. They resumed activity in the 1930's and launched the mechanical cabriolet 508 "Balilla" which got great success abroad. In 1947 Aldo Garavini took the reins after the death of his father. During those years, the bodies are handmade in deep crisis, so the couple prefers Garavini devote to those for buses. Although with all the orders and awards out there, in the 50s the company ceased all activities. 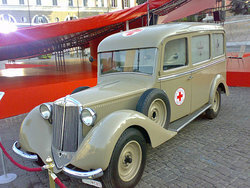 Bianchi S9 (1938) Ambulance (CROCE ROSSA ITALIANA, CORPO MILITARE) by "Carrozzeria Garavini"
Garavini coachworks was one of the most important ambulance builders in Italy. Eusebion Garavini, the companys founder, was active in this sector during the Great War and never left it, even when his coachbuilt sports cars became very popular in the 1930's. The medi-care compartment is rationally thought out and nicely finished with a little cupboard, a hand basin, two fold down seats and two stretcher carriers.